As a blogger, your web host is quite like your life line. A slow or unreliable web host may cost you hours of troubleshooting and, more worst, prevent readers from visiting your site altogether. How do you know which is the best web host for your blog? If you’re wondering which web hosting service is the perfect choice for your blog, then this post is for you. Below is the ultimate list of of the very Best Web Hosting For Blogs in 2017 as well as 2018. It’s mainly focused on the most suitable choices for all bloggers, taking into account your various needs, budget and requirements. This post is not only based on my experience, but also backed up by hours of researches online. Below I’ve shortlisted the top 9 of very the best web hosting for bloggers available online, rating them via various criterias such as reputation, ease of use, cost etc. Well then, I hope you’ll find the most suitable web hosting service for you! Side note: Web hosting services do come with a few minor and temporary discounts, price changes etc. so it’s rather impossible to narrow down its’ exact pricing. However, I’ve tried my best to update this post with the most recent price variations as of September 2017. 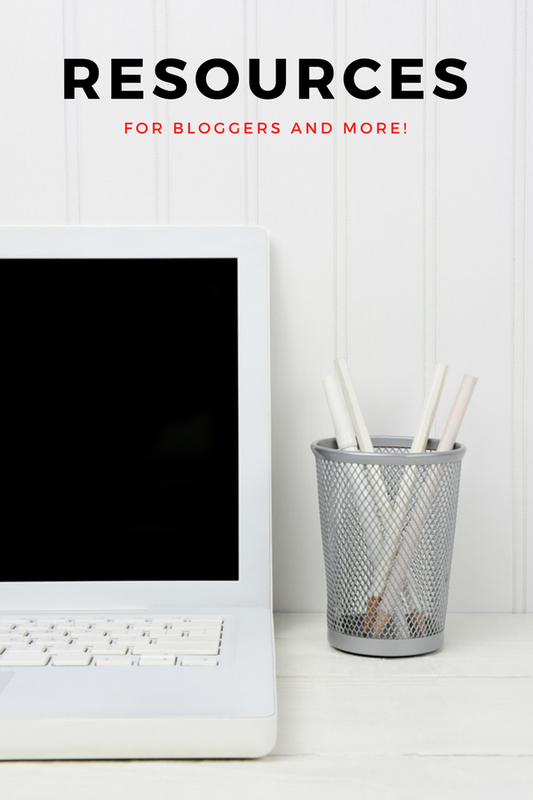 After you’ve found your web host, I’ve also included a button next to each services for a quick guide on how to setup your blog within a few minutes. as well as support quality. Alright, let the ranking begin. 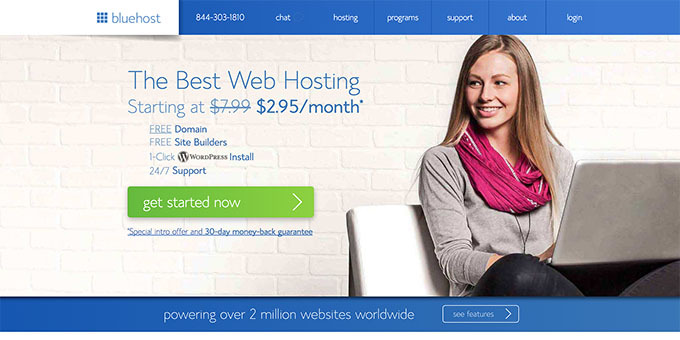 BlueHost is a web hosting service founded in 1996 by Matt Heaton and Danny Ashworth in Utah, USA. Having a staff of over 700 employees working around the clock, BlueHost prides itself in offering feature-rich web hosting plans for everyone at an affordable cost while still maintaining a reliable service quality. Today, BlueHost is managing over 2 million sites and domain names worldwide is has become one of the largest host in the world. 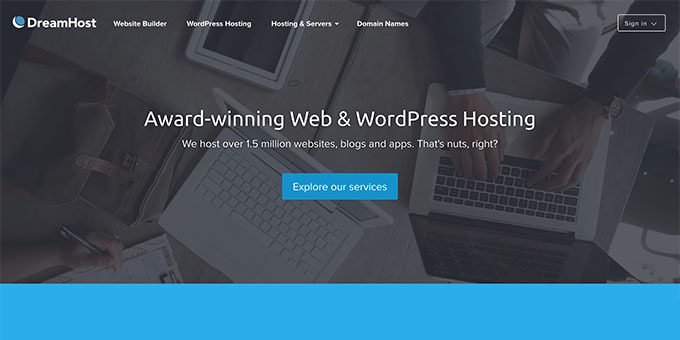 Aside from its’ already well rounded reputation, BlueHost is also widely recommended by a variety of the best bloggers on the internet such as Pat Flynn, Darren Rowse, Michael Hyatt, Ramsay Taplin amongst others. On top of that, BlueHost is also recommended by the biggest Content Management System (CMS) of all, WordPress, themselves. 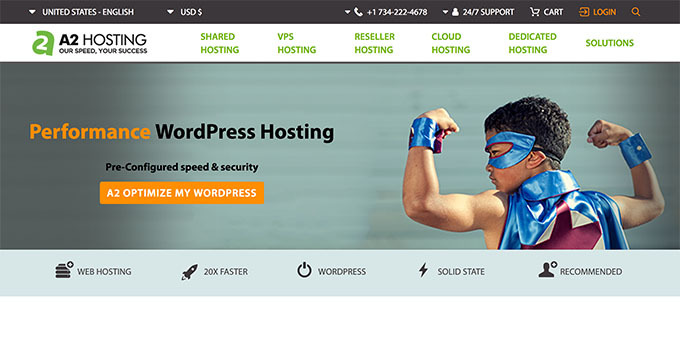 BlueHost offers five different hosting plans from Shared hosting, to VPS hosting, to Dedicated hosting, to WordPress hosting, to Cloud Sites. For most bloggers who are looking for an affordable hosting plan that’s easy to use and setup, then the basic shared hosting plan is all you’ll need. This is the perfect plan for most hobbyists as well as small businesses, the most expensive option, being Dedicated hosting is only needed for large online firms that are looking for full control over their servers. Featuring the easy to use 1-Click WordPress installation, BlueHost assures that you can quickly setup and get your blog working within a few minutes (you can check out my post How to Create a Blog with WordPress (Step by Step) to learn more). Most of BlueHost plans also include unlimited disk storage, domain hosting, email addresses as well as bandwidth, giving you more than enough space for your posts and images. BlueHost is also reliable, considering they’ve hit a solid 100% uptime score from January to August 2017, according to Best Host Ratings. They don’t disappoint in terms of speed either as Jerry from WHSR (Web Hosting Secret Revealed) reported lightning response time at only 23 and 26 milliseconds from two different United States servers. Another great thing about BlueHost is that they offer a one year free domain name once you sign up for their host. You can easily check and register your domain and blog at BlueHost by simply using the form below. 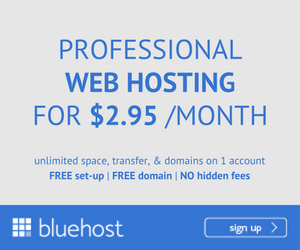 On top of their features, affordable price, starting only at $3.95 per month as well as an extra free domain name for a year for any hosting plans you bought from them, BlueHost also comes with a 30-day money back guarantee, no questions asked, this literally means you can ask for a full refund from BlueHost within a month, so long as you are not satisfied with their service. One thing you’ll want to note though is that although BlueHost comes at a great starting price, their renewal price starts at $7.99 per month, which is significantly higher. That said, this is a tactic used by the majority of web hosts including WebHostingHub, A2 Hosting, GreenGeeks, FatCow, Hostgator, iPage, InMotion Hosting and more, who tend to offer a cheaper starting price in order to attract new users. In terms of customer service, BlueHost offers a 24/7/365 support service which you can reach at all times, even during the holidays, this is great news for international users who works during different time zones. Whenever you need a hand, you can easily reach BlueHost via call, email or chat. Who is Bluehost for? BlueHost is one of the best choices for bloggers who are looking for a reliable host with a solid reputation. This is probably the most recommended host I’ve found amongst bloggers and online marketers alike, not to mention WordPress themselves. It’s an affordable choice, especially if you go for a shared hosting plan, which is the most suitable choice for general purposes. Especially since BlueHost has recently dropped its’ starting price down as low as $2.95 per month! That said, you’ll want to look out the renewal price, which is quite a bit more than its’ initial offer. SiteGround was started in 2009 ago by three university friends with a vision of taking web hosting to the next level with safer, faster and better support than other existing options. 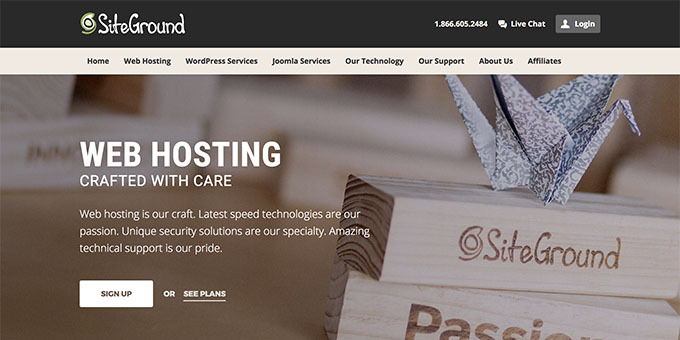 Fast forward a decade later, SiteGround has made its’ way to become one of the best web hosting services out there, boasting over millions of happy users as well, growing to a thousand servers across three different countries. 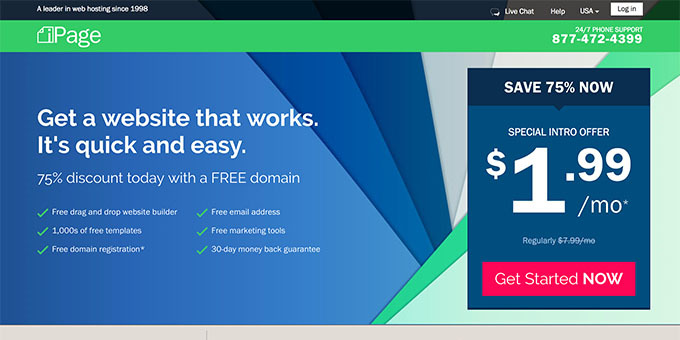 Starting at a great promotional price of only $3.95 per month (that said, you’ll want to note that their renewal price is slightly higher than other competitors at $9.95 per month), SiteGround offers several hosting packages such as shared hosting, cloud hosting, dedicated servers and more. As for bloggers, our best choice are shared hostings, which are easy to manage and comes at the best prices. SiteGround offers three different shared hosting plans from Startup to GrowBig to GoGreek, allowing you to save up on new sites before upgrading to bigger plans as your blog grows. One of SiteGround’s highlights is their offers of a managed WordPress hosting on all plans, this includes a one click install of this most popular Content Management System (CMS), free transfer if you happen to already host your blog elsewhere as well as auto updates so you won’t have to deal with all the technical sides and focus on your actual task of blogging instead. There is a reason SiteGround is a preferred hosting choice for many, and that comes down to their server stability as well as on-time support. In terms of uptimes, SiteGround doesn’t disappoint at all. 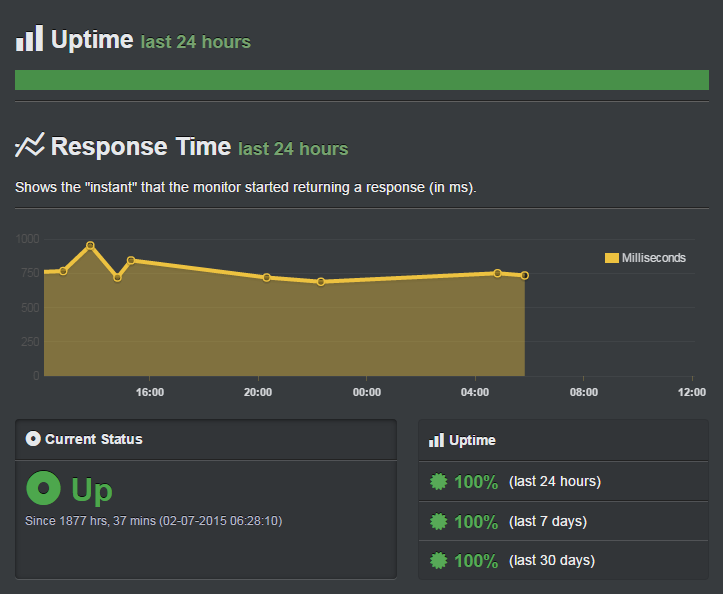 According to Hosting Manual, their SiteGround test site hits 100% uptime for 30 days consecutively. Furthermore, with their guarantee of 99.99% uptime, SiteGround promises to give you adequate compensation for any time your site is down for more than 0.01% over the course of a year. As for site speed, Bitcatcha reports a stellar 60 milliseconds load time on US servers. Last but not least, SiteGround has always been well praised for their customer support, some even goes as far as saying that SiteGround’s support team doesn’t just answer questions but goes above and beyond to work with them and solve their issues. Like most hosts, SiteGround offers many different contact options that are all available 24/7/365 from support ticket to live chat to phone call, so you can be sure to reach them at any times. Who is SiteGround for? If you are looking for a stellar host with great support to back it up, and doesn’t mind paying a couple of dollars more per month in the long run (as SiteGround comes at a great promotional price of only $3.95 per month), then you’ll want to check SiteGround out. With multiple shared hosting plans to start with, SiteGround allows you to pay as you go, instead of just one plan for all. 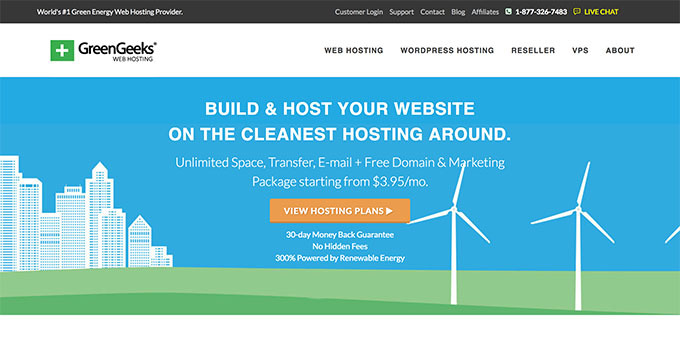 SiteGround is especially great for offering a Managed WordPress Hosting for all of their plans, so if you plan to use WordPress (my most recommended blogging platform!) then, you’ll definitively want to check SiteGround out. Founded in 2006, in California, USA, GreenGeeks is a web hosting service company that quickly garners a name for itself amongst businesses as well as individual users. GreenGeeks unique selling point lies in its’ brand name; priding themselves in providing green hosting, taking advantage of wind energy in counter the carbon output by their many servers (did you know that the average website is hosted on a servers that produces up to 12 1/2 tons of CO2 each year? ), so if you are not only looking for a good host but also one that promotes green energy then you’ll definitively want to check GreenGeeks out. It can be comforting to know that while you are working on your blog, you’re also helping the environment. With up to 300% carbon offsetting, you won’t be causing any excess of CO2 in the environment, your carbon footprint will, in fact, be a negative one. While Green energy is great and all, but of course, you’ll want a reliable host most of all, and GreenGeeks doesn’t disappoint in this department either. For all of their plans GreenGeeks offers unlimited resources, from bandwidth, disk space, to domain name email addresses for normal usage, with great server speed as well as uptime score. According to Hosting Facts, GreenGeeks scores a solid 99.99% uptime score from January 2017 to July 2017. Now starting at only $6 per month, GreenGeeks is slightly on the more expensive side compared to other hosting companies like BlueHost or iPage, that said they surely recompense with their quality and green service. Further proving their service quality, GreenGeeks offers a 30-Day Money Back Guarantee, no questions asked, meaning you can cancel anytime within your first month, so long as you aren’t satisfied. That said, GreenGeeks doesn’t offer a free domain name like most other hosts and you won’t get your money back on your domain name if you happen to also purchase it from GreenGeeks. GreenGeeks is also known for their dedicated, 24/7/365 customer support both via live chat and email support, which you can reach at all times, even during holidays. Some GreenGeeks users went as far as saying that they are “willing to help with problems which had nothing to do with their services.” This is a great reassurance for new bloggers who aren’t used to setting up a web host for their site. Who is GreenGeeks for? GreenGeeks is one of the few hosts that offers a completely green energy package. So if the idea of blogging while also helping the environment appeals to you in anyways, then GreenGeeks might just be the solution for you. Though being a green host is just a small perk as GreenGeeks’ true greatness lies in their quality service, solid web hosting experience as well as fast loading speed. Couple that with a dedicated support team, GreenGeeks is quite a deal if you are willing to pay a little more and help the environment as you blog. Based in Michigan, USA and founded in 2001, A2 Hosting was quickly known as a hosting service “by developers, for developers”. All of A2 Hosting’s servers are claimed to be privately owned and only accessed by their technical team, adding to an even better measure of security for your site. Offering the usual 1-Click install of the most popular Content Management System, such as WordPress, Joomla and more, as well as an easy to use control panel, A2 Hosting makes sure you can have your blog set up and going within a few minutes, even if you are not very techie. One of A2 Hosting’s highlight feature is their own custom backup tool, accessed within your cPanel (control panel) that provides you with various restore points to your database and files, in case you experience any issues with your site. And the best part is that this feature is accessed for free to all users, meaning you don’t need to spend the extra money on site backup. A2 Hosting is also great if you want to integrate eCommerce options into your blog as they offer a dedicated hosting plan called OpenCart that’s optimized to offer you the fattest loading speed. Aside from offering yearly payment like most web hosts, A2 Hosting also offers monthly payment options for those who prefer. That said they do come with a much higher price, at $10.59 per month, versus starting at only $3.92 when you choose a yearly billing cycle. As a web host for developers, A2 Hosting focuses primarily on their server performance and speed instead of promotions or discounts, making a name for themselves as a greatly solid host with a 99.9% uptime guarantee that doesn’t disappoint. Jerry Low over at WHSR (Web Hosting Secret Revealed) noted an uptime score averaging to 99.95% on his A2 Hosting test site from January 2017 to July 2017. In terms of speed, A2 Hosting boasts one of the fastest loading speed for a web host on the market. Jerry from WHSR (Web Hosting Secret Revealed) reported his test site scoring A and is loading faster than 86% of 10 million tested websites. What a pleasant surprise to find a company with such a strong focus not only on their technical prowess but a sincere and genuine focus on their customers. Who is A2 Hosting for? A2 Hosting is not the most well known host out there, compared to the big names such as BlueHost, SiteGround or iPage but they don’t come short in anyways in terms of their stellar service. You’ll want to check A2 Hosting out if you are looking for a solution that’s customer focused instead of trying for discounts or promotions, A2 Hosting’s servers comes with a super reliable uptime history as well as lightning fast speed, as they don’t tend to cram as much sites on one servers. On top of that, A2 Hosting also comes with a dedicated and on time customer support, a great reassurance for their customers. Starting at $3.92, A2 Hosting comes with a slightly higher price tag than most hosts, so if you are looking for a solid host for the long term and doesn’t mind investing a little more on your blog, then A2 Hosting is for you. Based in both Virginia and California, US, InMotion Hosting was founded in 2001 and soon enough made a name for themselves as a surprisingly quality hosting service as well as support, all starting at a regularly affordable price. 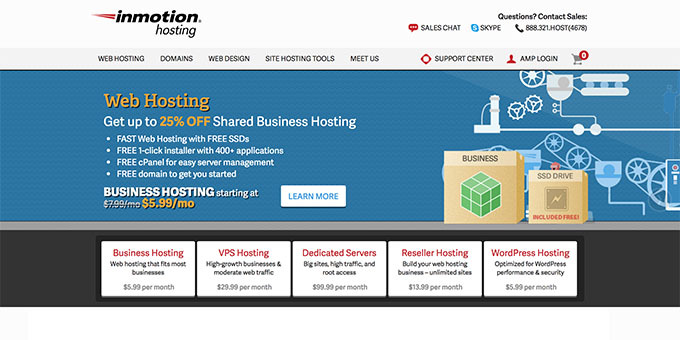 Now hosting over 500,000 websites on their servers, InMotion offers both a domain name as well as hosting package (if you host with them, you’ll also get a free domain name!) from shared business hosting, to VPS hosting, to dedicated servers, to reseller hosting. Again, as a blogger, your best choice will be a shared hosting for their affordable price, starting at only $5.99 per month at InMotion. Out of all the features of InMotion, one of their highlights must be their free backup option that’s available for all hosting plans, providing you with regular backups at no additional costs. If you are new to web hosting, I’d advise you to always have an automated backup service to avoid losing all of your hard works just because of some uncalled for bugs. InMotion prides themselves in their innovative technology, as well as a knowledgeable support team, offering 1 click install options for over 400 applications, including the very best open source Content Management Systems (CMS for short) such as WordPress, Joomla, b2evolution, & PrestaShop. InMotion doesn’t shy away from investing into their technology, with the trademarked Smart Routing technology, advanced DDoS protection & premium bandwidth providers, InMotion claims up to 99.99% network uptime. To further prove their services, InMotion has one of the longest money-back guarantee in the market, of up to 90 days. Backed by InMotion’s 100% satisfaction guarantee, you can ask for a refund anytime within your first 3 months, as long as you are unsatisfied with their services in anyways. I have more than 10 questions and with their live chat I was able to get answers for them as fast as 10 minutes or less. They even helped me process the payment and were with me the whole time. Even after a day, they sent an email to make sure everything was okay and it was a personalized email based on my last chat with them. The first thing you may notice about iPage is their incredibly cheap pricing starting at only $1.99 per month, a deal cheaper than most other hosts, even with their discounted prices. Aiming to be the best and most affordable host out there, iPage was first founded in 1998, offering several services for bloggers such as domain registration, shared hosting, VPS hosting as well as dedicated hosting. As of date, iPage is powering over one million websites worldwide, acquiring a name for itself as one of the most successful economical web hosting company. Offering a great price for the tight budget is one thing, it’s entirely another whether a web hosting service is good or not. And it will still be a waste of money and time if you bought into a bad host that is down all the time. Fortunately, iPage doesn’t disappoint in their server stability. iPage’s server uptime hits a solid 100% from January 2017 to July 2017, according to Web Hosting Stuff. This is an impressive score for any hosts, and a great news if you consider hosting your blog with iPage. 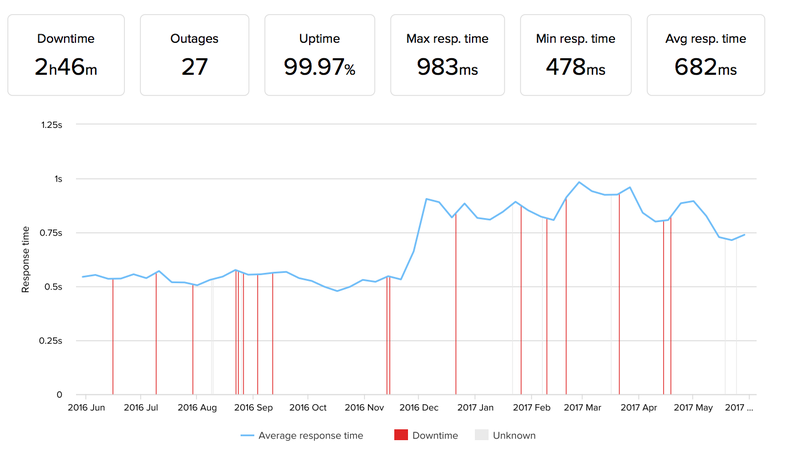 That said, uptime is not everything when it comes to a web host’s performance. There is yet another factor that may cost you over 30% of readers, and that’s site speed. Jerry from WHSR (Web Hosting Secret Revealed) reported their iPage site speed using Bitcatcha of only 72 and 27 milliseconds from United States servers (that’s less than a second load time!) That said, it’s worth noting that web hosts can still go down, and it happens to even the best of companies due to hardware failures, for their part thought, iPage certainly hailed a stable and solid uptime record history. While, iPage is a great way to start your blog without the need to over invest in it, you’ll want to note that coming at such a good price, their host is not as robust as others and is not a great choice if you want to build a huge blog with an eCommerce feature, for example. Another great thing about iPage is their full money back guarantee. For up to 30 days, if you are not satisfied with their host for any reasons at all, you can ask for a full refund, no questions asked. In terms of customer support, iPage offers both a phone line, live chat and a ticketing support that’s available 24/7, meaning you can reach them any time for either technical or any other queries. iPage is known for their on time and quick support, which quite a crucial thing when you are new to the web hosting scene and in need of some assistance. Who is iPage for? iPage is probably cheapest hosting you can find that comes with great and reliable services. Whether you are on a tight budget or just looking to start your blog without having to invest too much into it, then you’ll definitively want to give iPage a try. With a great record of server uptime, site speed as well as a dedicated customer support team that are available 24/7, iPage certainly doesn’t disappoint. HostGator is considered the most well-known web host in the world. And that’s not really an exaggeration either, seeing that HostGator powers over 9 million websites, and amongst them are some high profile brands such as Cisco, AT&T and Dell. 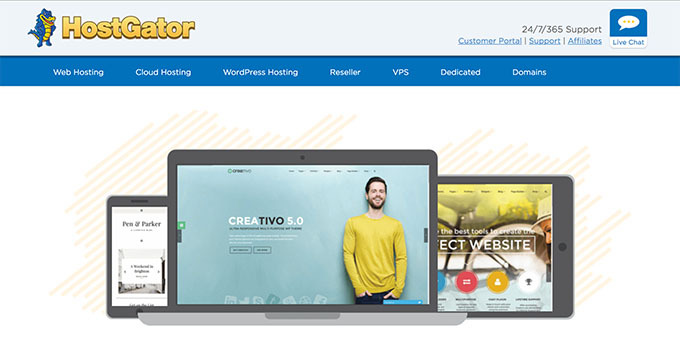 Founded in 2002 and cased in the US, HostGator offers several hosting packages, ranging from shared hosting, WordPress hosting, VPS hosting, dedicated hosting as well as reseller hosting. 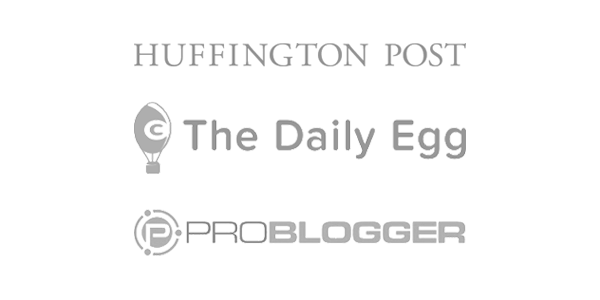 For us bloggers though, the best package would the shared hosting for they offer all the features we need at the most affordable prices, and for HostGator, that starts at $3.95 per month. HostGator features a top of the line user interface with their cPanel as well as all the 1-Click installs you need to get your blog started within a few minutes. HostGator prides themselves in owning some of the best technology for their servers and equipment resulting in a fast and reliable hosting experience for their users. According to Down.com, Hostgator’s uptime score averages to 99.97%, and 100% from July to August 2017. Hostgator doesn’t disappoint in terms of speed either, as Down.com reposts an average loading speed of 2.88 seconds, a few milliseconds faster than even BlueHost, DreamHost or GoDaddy. Another great point about HostGator is their 45 days money back guarantee, which is already 15 days more than their usual industry standards. During this time, you are allowed to ask for a full refund on your host (you’ll want to note that this doesn’t include your domain name, though), no questions asked, so long as you aren’t satisfied. In terms of customer support, HostGator offers various contacting options ranging from phone call, live chat as well as a ticketing system that’s available 24/7/365. In this area though, HostGator does receive quite a few conflicting reviews, some claims they are slow to reply and unhelpful while others has a much different experience, receiving dedicated help on time. Live support is extremely important when it comes to web hosting as any moment your blog runs an issue or is flat out down, means losing your visitors, readers, or even sales. In my personal experience, HostGator only takes around 3 minutes to get back to me on their live chat and the support team has been helpful and dedicated. So if you are considering Hostgator, I’d suggest your check their support out for yourself, even to ask some quick questions. Who is HostGator for? If you are looking for a reliable host with a good reputation then you’ll definitively want to check HostGator. They are easily the most well-known host in the industry and hosting millions of sites worldwide. With their easy to use cPanel and 1-Click install options, you can easily setup your blog within a few minutes. With their famously reliable server performance as well as speed, you rely on Hostgator to deliver your content to your readers with a breeze. That said, starting at $3.95 per month, Hostgator isn’t the most affordable host you can find, so if you are looking to save up or don’t want to invest too much on your blog just yet, you may want to go for some cheaper alternative such as iPage or BlueHost. “Proudly hosting over 1,500,000 websites since 1997” says DreamHost on their homepage. Founded in the mid-nineties by some undergraduate students at Claremont College, California, DreamHost has grown its’ user base to over 400,000 active customers within the decade and winning several awards such as PCMag’s ‘Best Web Hosting Service’ two years in a row. Some says DreamHost is the dinosaur for web hosts. And they truly are for several reasons, starting with their bold 100% uptime guarantee that credits you with one day of free hosting for each one hour of downtime (DreamHost will start counting your downtime once you send out a support ticket). To further prove their services, DreamHost also offers up to 97 days of money back guarantee for shared hosting (do note that this is only available via credit cards payments), the longest refund time ever for any web hosts. DreamHost offers several hosting services including shared, VPS as well as dedicated hosting. For bloggers, of course, your best choice is shared hosting. With their own control panel designed to fit both starters and experienced users, DreamHost starts at $7.95 per month and offer a one-size fits all shared hosting plan to get your started. This can save you some stressed in pondering which hosting plans suits your blog better. That said, it also means you’ll have to pay the same price as other established sites with thousands of visitors. In terms of performance, DreamHost stays true to their uptime guarantee and records an exceptional 99.97% uptime score within the last 12 months (from August 2016 to August 2017), according to Hosting Facts’s test site. This puts DreamHost amongst the best web hosts in terms of uptime scores, being 0.18% better than the industry average. DreamHost doesn’t disappoint in terms of page speed either, averaging 834 milliseconds in terms of loading speed over the last 12 months. 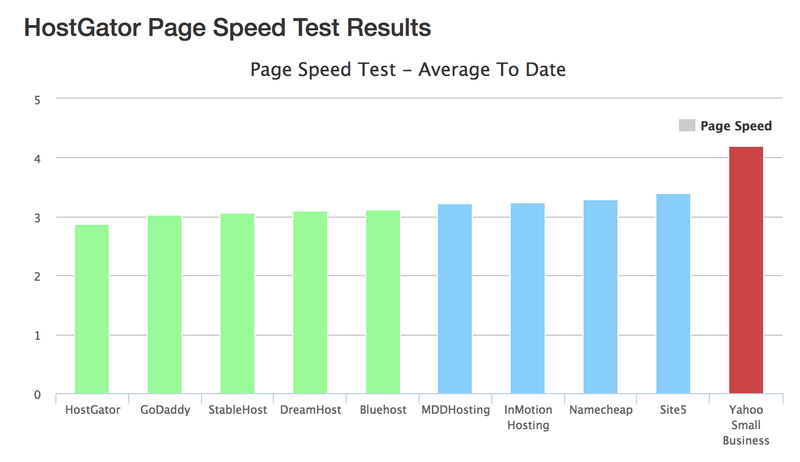 According to Hosting Fact’s tests, that’s about 26% faster than other web hosts. In terms of support, DreamHost offers both live chat and email support 24/7 at surprising speed. You can expect to connect to a live chat agent within 5 minutes, and emails to be replied within hours — which a rarity within the web host industry. DreamHost is known for their experienced, in-house support team, ensuring their users with quality and prompt support as opposed to an outsourced team. Tech Support is awesome. You can get anything you want from their tech support, even if you are new to the web hosting stuff. Who is DreamHost for? If you are looking for a reputable and stable host as well as a dependable support team and don’t mind paying $7.95 per month for your blog, then you’ll definitively want to check DreamHost out. It’s certainly a dream host with their one of a kind 100% uptime guarantee as well as a great refund (1 free hosting for each 1 hour downtime) to back it up. In addition, DreamHost also offers the longest money-back guarantee for up to 97 days for shared hosting (only available for credit card purchases), you can’t go wrong with a service like this. That said, do note that DreamHost doesn’t offer phone support, it’s something worth considering if that’s your preferred support method. InterServer is a privately owned web hosting service founded by Mike Lavrik and John Quaglieri in New Jersey since 1999. Starting out as a virtual hosting account reseller, InterServer has grown over the decade to provide web hosting services to their customers, operating two data centers in New Jersey, and are now in the process of expanding to additional locations, such as Los Angeles. InterServer offers different hosting options including shared, VPS cloud as well as dedicated server hosting. For bloggers whose best web host package is shared hosting, InterServer offers a one size fits all plan at $5 per month. And the best part about InterServer is that they don’t add up on their renewal price, InterServer even sets up a Price Lock Guarantee, instead of offering a low promotional price at first and adding up to it, InterServer makes sure you only have to pay the same amount, year round. And at only $5 per month, their pricing is actually lower than a lot other hosts down the line. In terms of performance, InterServer comes with a solid 99.5% uptime guarantee that’s backed up by their Service Level Agreement (SLA). Making sure that anytime InterServer fails to meet this guarantee for any given month, they will credit you on a case by case basis. InterServer doesn’t fall short in terms of speed either, scoring a solid 66 milliseconds from US servers, according to Bitcatcha. Last but not least, if you’ve ever used a web hosting service, you’ll probably realize the importance of customer support, and in this area, InterServer also excels. Offering multiple 24/7/365 channels of communications such as live chat, phone and ticket support and a tag line “We’re always here to help”, InterServer are known for their quick and efficient support which surprises many of their users. So at 3 AM I decided to send a trouble ticket. Well I had already started getting really angry because I knew I would have to wait till the morning or maybe a day or two till someone would care to look at my problem. At least that’s how I was used to, with burst. WRONG. Not at InterServer. After only 45 mins I got a message saying FIXED. Who is InterServer for? 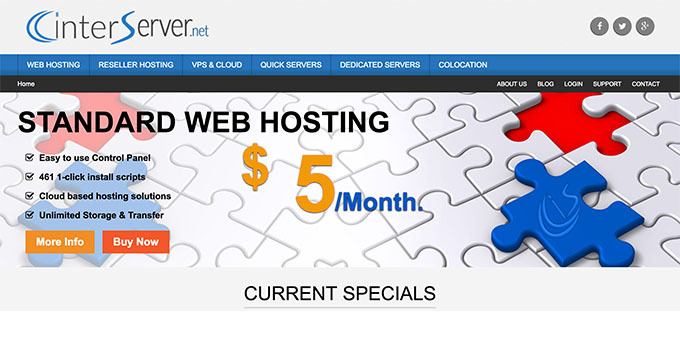 If you are looking for a long term, affordable web host then InterServer is definitively a host worth checking out. With their awesome Price Lock Guarantee, you are sure to only have to pay for $5 per month years round, an awesome pricing when you consider the renewal prices of other web hosting services. Preferring quality over quantity, InterServer has setup an account signup per day limit since 2016, allowing their support team to tend to your issues more efficiently than ever. And a fast and effective support team is a great thing for both new and experienced bloggers. It’s the end of our list of the very best web hosts for your blog on the internet, I’ve tried to write this list with an unbiased mindset and be as factual as I can, focusing mostly on the target customers of each hosts instead of my personal preferences. To conclude though, here are my personal recommendations. If you’re still unsure about which hosts to pick, I strongly recommend you check out one of these two services. The best web host I’ve found that well-balanced service to quality is BlueHost. Most of their hosting plans all comes with unlimited disk storage, a free one year domain name as well as domain name email addresses, BlueHost comes with a neat-looking and super easy to use user interface that helps even the non-techies like you and me to create our own blog with ease. Packed with excellent security features, BlueHost also comes with satisfying customer service as well as an affordable price range that fits most budgets, from shared hosting to a top-notch dedicated WordPress hosting, you will be able to find a plan that fits your blog at BlueHost. On the other hand, if you are looking for an even cheaper option for a small hobby blog, then you’ll definitively want to give iPage a try. Starting at only $1.99 per month, iPage is the cheapest web host you can find while still maintaining a sound service. iPage is owned by the Endurance International family, the same company behind BlueHost, and while they have their fair share of complaints, both iPage and BlueHost were undeniably professional when it comes to customer complaints and all comes with a up to a month of money back guarantee, no questions asked. Meaning iPage has to work extra hard to keep you as their customer. With an unlimited storages, great uptime scores from all reviewers, as well as an extra fast customer support, iPage is a perfect deal if are just looking to build a small blog. Above are the best hosts I know and used, it’s your turn to pick out the best services for you and your blog, considering both budgets and functionality. If you’ve tried any of these hosts, do feel free to share your experiences with me in the comments section below. What is your top choice for a blog host and why? Are there any other hosts that you’d like to add to this lists? If this is your first time buying a web hosting, which services are you most interested in giving a try? Which one are you tempted to give a go? And of course, you have any other questions regarding blog hosting, drop them in the comments section below as well, and I’ll try my best to answer them! Great information. Since last week, I am gathering details about the hosting experience. There are some amazing details on your blog which I didn’t know. Thanks. You shared quite useful web hosting options for blogs. I’ll follow your suggestion for my upcoming projects. thanks for the list. We previously mostly used Blue Host but now we have lots more hosts to try. Gary, I’m glad to hear my post has been helpful to you. 🙂 I hope you found other hosts that fits your needs. A very good and detail comparison on web hosting companies, it really provides a good insight for readers to make an informed decision. Of the 9, I have use Hostgator before and now have websites hosted by Bluehost and I have to say, blue host is still the best especailly when you are using WordPress for building your website. It is so much easlier to set up using blue host. Thanks for sharing your experience, Jaunesk. 🙂 It’s always my pleasure to help. I consider selecting a good hosting company is key for anyone who wants to create a blog. I love all the companies you mention with all its features and monthly prices. Personally, I would choose the one that has excellent support and help me quickly to solve problems, especially technicians. Excellent article any help I need I’ll contact you. Regards! Hey there! I’m so glad you found my post useful. And yes, feel free to message me either on my blog or through my contact page if you need anything! Hi Anh, Thanks for ranking we hosting companies in a way which is so helpful to compare them. I like your comparison very much. I bookmarked this post and I will refer to it later. I have heard good words about the Bluehost hosting company but never tried it. Maybe I will try it for one of my blogs. It’s not either too much expensive. Hey Anh, nice comparison here. I will sure keep this post in my favorites bar, and come back to it for my next blog. I’ve heard a lot about Bluehost and glad to see it ranks in the top choice. It’s not too expensive either, I will probably give it a go sometime. Thanks for sharing the list of webhosting options. I was going to start a blog site mainly for my niche and I was shortlisting a few. Bluehost seems to be a good option to consider and it isn’t too expensive compare to some of the other webhosting solution available in the market and they may not offer features as much as Bluehost does. It definitely goes into my shortlisted list now. Hey there, I’m glad you found the host to fit your needs. I wish you all the best with your blog. 🙂 Feel free to ask if you have any questions. Thanks for that wealthy of info. I always thought BlueHost was mainly for larger companies. How about Godaddy for hosting? Have you ever used them? I know when you use them, your domain names are also free. This site has top resources I will have to keep up to date with, thanks to your expertise. You were very thorough with your research and experience with web hosting platforms. I liked that your post was easy to read and understand. When I decided to jump into blogging this is something I would have valued as good information about web hosting. It also contains great personal experiences as well as opinions. keep it up! Very informative. I am current member from Wealthy Affiliate but I previously used Bluehost and Hostgator. You know for being web hosting services…I believe those are the best ones for blogging. They are both affordable and customer service will help you. Not like other web hosting it will take a decade for them to return message! Where I’m pretty new to blogging, I wouldn’t know one web hosting service from another. The only one I’m familiar with is Wealthy Affiliate. I’m pretty happy with them and I don’t see why I would change in the foreseeable future. But you never know what could happen. So I found you post extremely informative and help me make a decision if I ever do look elsewhere. Thank you and keep up the good work. Hey Dustin, I’m glad to hear you found my post useful! Wealthy Affiliate is a great premium hosting if you are building your online business. I’d say you’ve gotten yourself a quality web host there. This is an excellent analysis of the many different types of hosting services out there. I personally have used Hostgator and Bluehost. I have to agree with you that Bluehost is one of the best. I have had it for a few years and haven’t had any problems with it. The renewal price is a lot steeper, but it is reasonable compared to what other people are charging. Aww, thank you Melinda! I’m glad you enjoyed the post! But there sure are quality hosting platforms out there. Thank you for post anyways, it doesn’t hurt to learn about other services as well. Victor, I also host my main blog at Wealthy Affiliate so I know what you mean. 🙂 And I’m glad you enjoyed my post, it’s a pleasure to see how my writing can be of help to others. Your article was much helpful, although I already have a hosting platform where my sites are hosted. I was very excited to see that there are so many hosting platforms to choose from. Among the list you provided, I have heard about BlueHost and also HostGators but for the rest, I have never heard about them before, so thanks a lot for sharing them with me. I know BlueHost for their good hosting platform and also their reputation, and definitely I will surely get my website hosted on their platform in future. But my question is, currently, I have my site hosted on Wealthy Affiliate’s SiteRubix platform, so what do you think? Comparing Wealthy Affiliate with BlueHost and other hosting platforms, which one will you best recommend to me, as the best option? I’m glad you found my post useful! As for your question, Wealthy Affiliate is a an all-in-one play form for those who are looking to build their own online business, including, among their web hosting services, courses, weekly webinars and an active community. If we were to compare only WA’s web host alone, I’d say they are a premium quality WordPress hosting with fast support via a ticketing system, where the team will get to you within a few minutes. So if you are already a member of WA, I’d suggest you host your site there as well. 🙂 It’s where I host my main site also. The only reason I didn’t add WA to the list was because they are not a put web hosting service and cost much more than other brands. Great list of hosting platforms, but I have a different view. Many of these hosting platforms will make you pay extra for an email address, or an SSL certificate, or a Spam protection package, or a privacy package. GoDaddy are the worst with all their add-ons. My best hosting package is Wealthy Affiliate, where you get great Education, Community Help, access to many successful mentors, continuing up to date training, and many more services. Hey Greg, thanks for sharing your hosting of choice! A lot of these hosts such as BlueHost and HostGator does offer free SSL certificates and other bonus services. That said, I see your point in wanting a whole package, and choosing Wealthy Affiliate. 🙂 WA is where I host my main blog as well, the only reason I didn’t mention it because they are more of an all-in-one online business course and comes at a much higher price ($49 per month) than other pure web hosting providers. I believe now, I understand better why top marketing professionals use BlueHost to maintain their sites presence, such as Pat Flynn. He’s a great guy to listen to with positive energy every day! I wonder how he has time on his hand to develop these special niches, but I see that the #1 option to hosting is BlueHost. I just finished reading your article on 9 Best Web Hosting For Blogs 2017 – 2018. I agree that Bluehost is the best. I’ve been using them for years and will always be a loyal customer. Their customer service is also vey good. If you should have issues, they’re always quick to respond. Great article! I have not used any of these hosts for years, but have used HostGator, because it was recommended at the time. Now I use other various hosts depending on the site, such as Wealthy Affiliate. A little surprised they were not mentioned here, at least as a blog hosting platform. Thanks for making mention of these other ones for full web site hosting. Hey Andrew, I agree that Wealthy Affiliate is a great host! In fact I’m using it on my main site here. That said, they are more of an all-in-one package for building an online business and comes at a much higher price than normal hosts, which is why I didn’t mention them on this list. Wow! I didn’t know there were so many options for hosting. I personally use and love BlueHost, but I didn’t know that there was iPage, which is incredibly inexpensive! I think this is a great option to know about for people who are starting a website on a budget or who want to use it for their hobby. Thank you for creating such a valuable resource for website hosting! Great article on the 9 best web hosting for blogs in 2017 Anh, you have given some great options here! I’m not surprised that Bluehost is top of the list, I have heard some great things about this platform and I have seen a lot of recommendations for using it! I have also used Hostgator in the past, and still use it for one of my websites, and I am very pleased with it. Considering that Hostgator comes in at number 7 on your list, I don’t think that you would go wrong with any of these choices, but I will definitely go with Bluehost for my next website, after all, the best is the best, right?